3 x 120 or 2 x 140 on the front intake....opinions? Normally I'd think the 140s but the way the case's front steel has been stamped it looks like they wouldnt have total open-aperture awesomeness (unless you dig out the Dremmel and start pruning). I have faced this decision two times, on the Define R6 i opted to go with two 140mm for the front and on Corsair Air 740 i opted for 3x 120mm fans. The reason for doing it, i felt the Corsair opening for 140 were not that well design and if were to go that route i would have had to dremel it to feel ok with it, now on the R6 the opening seems better thought, thus going with two 140 on the front, also i had my doubt into the bottom also adding two 140 so didn't know if 120 would overlap or not. My recommendation is base your decision into how is the front panel designed and the fans you plan on using, in some it might be a big difference, for example Antec True Quiet 140s sell around $12 ($24 to populate), while Noctua NF-A12x25 sell for $30 ($90 to populate), big difference. Thats a great shot of the front you found. It looks like a 140 in the topmost position would be all but unobstructed, but a second one under it would at very least have that 2nd horizontal "bar" plus the corners encroaching on its aperture a little bit. Nitpicking to be sure, but if using the filter (which I plan to) ever square millimeter of material in the way adds up. Looking at that I'm thinking that a 140 at the top with one or two 120s below might make the most sense (as long as the two different sound signatures dont sum more objectionable than sticking with a single size/model). BTW, where these cases have "slots" instead of holes for mounding fans, if using Noctuas rubber fan mount thingys would there be a tendency for them to "slide" down over time I wonder? I'm confused. In both of the pics the fans are in the lower position, with the "topmost position" empty. You can therefore directly observe the degree to which the lower position is blocked. I have heard of people who have fitted a third 140mm fan below the lower position on the Define C (which is perhaps the position that you are talking about), but that this requires case modding. 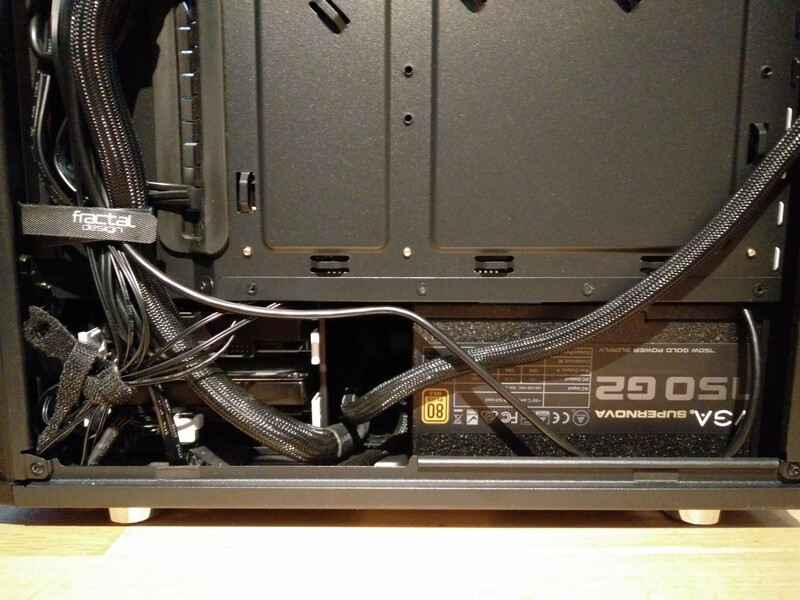 Also, I think the 'horizontal bars' you are talking about may be the PSU shroud and/or HD cage, which are quite a bit further back from the front of the case. A 140mm in the top position is mostly unobstructed (but its not what I would call perfect). A second one under it definitely starts to have some metal in the way, especially that lower bar (depicted in purple). This is why I'm thinking the best arrangement might one 140mm way up top and either do a fair bit of dremmel-cutting for a second one OR use one 120mm below it. I think you'll need to adjust the shroud at the bottom to fit three fans at the front. I got a Define C for my kid and needed more than the stock ventilation. Opted to buy two 140mm fans to mount in the front, moving the stock front fan to act exhaust at the rearmost position at the top. That solved the cooling problem. My Define C should be here tomorrow so I'll get a better sense once I see it in the flesh. What I might do to try and spread the cost out a little is start by moving the included rear fan to the front (so 2x120mm Fractals there) and get an NF-S12A for the rear. Then down the road look at upgrading the fronts to either a pair of NF-P14 fans (I take it the consensus is they are better than the A14? ), or maybe TrueQuiet 140s (at half the price)? If I was rolling in dough I'd try a pair of NF-A12x25: Noctua is talking some pretty strong smack about these but they better be a religious experience at C$38 a fan. Last night we replaced the power hungry old graphics card, (Asus Radeon R9 280 DirectCu II) the very reason for adding lots of case fans, in that computer with a new leaner one (Palit GeForce GTX 1060). When I started the computer after the switch I had to check twice to verify that it had started, since I didn't get any audible feedback from noisy fans... In fact I couldn't hear it at all! Wow. I didn't realize it until you pointed this out that the thin frames do obstruct my 2 x 140mm fans. You're even pickier than I am . I have my fans as close together as possible due to reading someone's anecdote years ago that the coolest region is at the level where intake fans touch each other (i.e. in the centre). This means my top intake fan is at the lowest position. I haven't monitored any temperature difference through testing yet. Let us know if you do. Q: Why are you comparing 2 fans to 3? Because we are doing whole system testing. 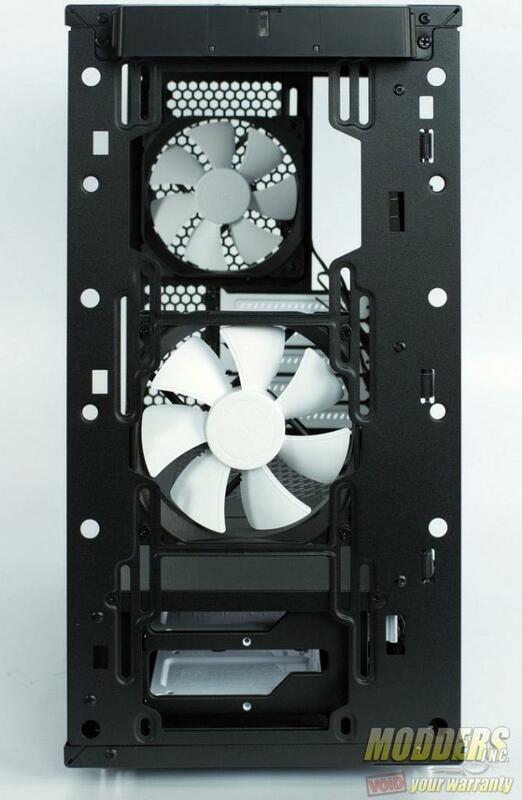 2–140/3–120 is becoming a common fan layout in cases, so it makes sense to compare how other people would setup their cases to maximize airflow. From the fan’s spec sheets, a single A14 can generate 115.5 m³/h airflow with the L.N.A, while an individual A12x25 can generate 84.5 m³/h with it’s L.N.A. An apples to apples comparison would result in a 36% difference in airflow, whereas 2 vs 3 results in a 9% difference. (2*115.5) = 231 ≈ 253.5 = (3*84.5). From the data below, we can see that the setups are very close in cooling performance, but the 3 NF-A12x25’s do have a few degree edge over their 140mm brothers. The temperature and noise measurements for the NF-A12x25 show that in this setup it has an edge over the NF-A14 when used as case fans in these configurations. Interesting, good thorough reporting. Results I think slightly skewed because he is comparing the standard (in Noctua terms) 140 to their super high-end 120. In the broad context of 2x140 vs 3x120, he might have compared fans of similar tech level (2 x NF-A14 against 3 x NF-F/P12 for example). That A12x25 is a pretty serious fan, almost in a class by itself. I was emailing a bit with someone at Noctua and they sounded pretty jazzed about it. And they make a good point: never is a high m3/hr fan used in open air (even the most unrestricted case presents some resistance) while a high mm-H2O fan is never pressed up against a brick wall (no heat-sink is ever totally resistive). So if all you do is look at the specs, the A12x25 doesnt look like it excels at anything...BUT its that middle section which is actually manifest in the real world and in that context, if Noctua is to be believed, this new fan beats the crap out of all their previous efforts. From the email conversation I had with them: "It's worse than most fans in terms of specs, but it outclasses any fan out there right now. And not only a little. Even most 140mm fans is beaten compared to this fan, including our own NF-A14 PWM." Because we are doing whole system testing. 2–140/3–120 is becoming a common fan layout in cases, so it makes sense to compare how other people would setup their cases to maximize airflow. I'm trying to decrypt what these results will mean for the Define Mini C. Although it can also accommodate 3x120mm, the diagram in the manual shows that most of the bottom fan would be blowing underneath the PSU shroud, potentially severely reducing its effectiveness. ... the diagram in the manual shows that most of the bottom fan would be blowing underneath the PSU shroud, potentially severely reducing its effectiveness. 1. It will help cooling any HDDs mounted at the bottom intake. 2. There's a hatch in the top of the shroud that you can remove to allow the air to blow up there after cooling the HDD. 3. ... or you can remove the shroud altogether. The shroud lid is right at the front, so if there's a fan blowing there even with it open, the force of the fan's blowing air will constantly overpower the drive's heat towards the back of the case and I'm not sure how it can escape. Removing the shroud is the only answer I can think of it, but it requires a bit of modding and possibly compromise the structural integrity of the case as a whole. Edit: I forgot about the shroud top vents at the back. That's how heat will escape, but it will be super tight spacing because the PSU is there. Last edited by yakuman on Thu Jun 07, 2018 6:24 am, edited 1 time in total. How much heat do a couple of HDDs produce compared with a CPU + GPU? Is allocating nearly one third of your air intake to cooling them effective use of your fans' output? Such a bottlenecked and circuitous airflow is also unlikely to be particularly effective, particularly as the drive cage is only fractionally smaller than the hatch. I would not however be averse to the idea of having the fans blowing into the top chamber, but leaving the hatch removed so that whatever little heat the HDDs produce can rise into the airflow and be blown away. No you can't. It's permanently fixed. You don't allocate the fan to cool the HDDs only. You have some air cooling the HDD before cooling the other stuff, which is better than having no (active) HDD cooling. As long as you have any exhaust fan it's definitely not a problem. My error. I read the manual a year ago and remember the cooling options to be very flexible. 1) The air resistance from (i) the Drive Cage, (ii) the PSU & (iii) the small size of the vents above the PSU would mean that virtually no air would get from the lower chamber to the upper chamber in order to cool "other stuff", with the hatch in place. 2) In most modern builds, HDDs are (i) fairly efficient & (ii) only lightly used (as SSDs do most of the heavy lifting). I would therefore question the need for any active cooling of them (unless of course you had a large number of them and/or no room for convection). 3) Look at diagrams 2a and 2b on page 12 of the manual. This demonstrates what a tight fit the drive cage is to both the hatch opening and to the lower chamber. The air resistance of this will reduce airflow, regardless of whether there is an exhaust fan in the opposite corner (top back versus bottom front) of the computer.It will be slightly better than the hatch left in place, but not by much. I would suspect that the only way to allow significant airflow from the lower to upper chamber would be to remove both the hatch and the drive cage. This would appear to be fairly basic and intuitive fluid dynamics. You remove the hatch and move the drive cage to the rearward location. Then the airflow will blow onto the drive cage and be deflected upwards. The exhaust fans help steering the flow from there. 1) Diagram 1 of p8 would appear to indicate that there's not a great deal of room between the drive cage and the PSU, taking into account the room PSU cables will take up -- probably about an inch unless you either badly squash the cables and/or have a particularly short PSU. 2) This arrangement would mean that the air from the bottom fan would flow up into the upper chamber before it reaches the cage, meaning that the HDDs would receive fairly minimal extra cooling (basically it would benefit only from an 'eddy' effect of the main flow). 3) The cage only an inch in front of the fan would still constitute a fairly significant obstruction (though considerably less so than the stock placement) of the airflow from the bottom fan. 4) Air tends to follow the path of least resistance. This means that the main effect of the exhaust fan will be to improve airflow from the upper two unobstructed fans, and that the effect on airflow from the obstructed lower fan will be considerably less. Addendum: "An inch" may have been a bit on the generous side, as this image (too large to show inline) seems to indicate. Indeed the length of the PSU is a factor here in that a long one with modular connections at the back may limit just how far forward the drive cage can be moved. I didnt move mine back at all (yet) and I found it a fairly tight fit (with an RM650x). Point of clarification: lets call the "shroud" the entire riveted non-removable channel at the bottom. Lets call the removable panel at the front above the drive cage the "removable panel" or something. You MUST remove the panel in order to install a fan in the lower most position anyway. On the ATX C its a bit different in that you literally have that extra 1.5" inches. If you use 3x120 you can move them all up 20mm so that the lowest one will extend below the top of the shroud that much less, firing more air into the space below the GPU, but then we are back to the question of how much, if any, turbulence those bars cause. So long as the case can accomodate it, which the Define C can, 140mm is better than 120mm for airflow and silence. The Define C's "accommodation" is a little screwy though: The max width of the front fan aperture is 120mm. Minor perhaps, but if we are splitting hairs, in order to realize the full potential of any 140mm, I believe a bit of cutting/dremeling is in order. I am not sure that a small amount of obstruction is going to make any difference to an intake fan. The amount of blocking of the Define C intake is similar to the Fractal R5/R6 if dual 140s are fitted and I haven't heard of anyone suggesting that they need to be dremeled. A standard ATX PSU is 14 cm long. The drive cage use ~10 cm and a front fan 2.5 cm. Totally 26.5 cm. That leave about 10 cm to split between cable compartment and distance between front fan and drive cage. 1) ATX PSUs of greater than 'standard' length are very common. 14cm is is more like the minimum than the average. 2) The drives "use ~10cm" (10.16cm to be exact). The addition of the sleds around the drives, and the drive cage around the sleds would add at least a couple more cm. All these subtractions add up, eating away at the small amount of leeway. Thinking about it further, given that the bottom fan of a 3x120mm stack is more obstructed than the upper two, wouldn't that mean that it would produce more turbulence and thus noise at a given rpm than the others, and that to minimise noise for a given airflow, you should run it at a lower rpm than the other two? This also raises the possibility that if active cooling for the HDDs did become an issue, and you could find/build a 80x80mm to 80x120mm adapter, you might add a low rpm 80mm fan (such as the Noctua NF-R8 redux-1200, 9.1dB) to a 2x140mm stack, to provide a little airflow for the HDDs. Individual fan speeds can matter. Especially if two fans run at almost the same speed (a few rpm apart) there can be an added resonance/interference effect where the combined sound increase and decrease with the same frequency as the speed difference. My main point from the start of this discussion has been that from an aural point of view using three (low noise) 12cm fans is neiter worse nor better than using two 14cm fans, only that it takes some effort to make the bottom fan fit.